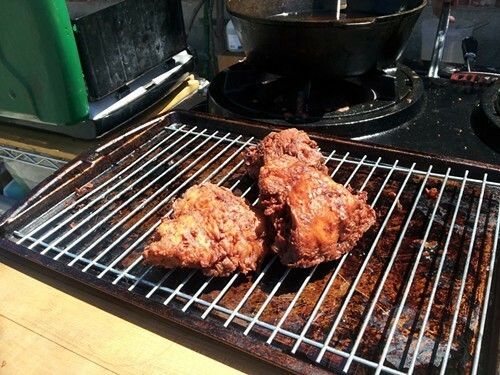 Great news for fans of The Grease Box Mobile Kitchen’s amazingly good fried chicken and other gluten-free goodies: Owner Lizzy Boelter told What the Fork that she just signed the papers for a brick-and-mortar space in Oakland’s Temescal district. It'll be a quick turnaround: Boelter hopes the restaurant will be ready to open, after a slight remodel, sometime in mid-July. Boelter said she needed to finalize a few details before announcing the exact location (she's taking over a spot occupied by an existing business; anyone have a guess? ), but the general plan is to serve coffee and pastries in the morning, sandwiches and fried chicken at lunch time, and barbecue — maybe even her famous coffee-chili rub pork ribs? — for dinner. All of the food will, of course, be gluten-free. Stay tuned for further details.